"Everything on the menu is grilled, smoked or charred," explains our Del Campo server during his introductory remarks, a description apt to tantalize diners like me who love food prepared in some way with real fire. Opened in the spring of this year, Del Campo is, as its website explains, inspired by the lifestyle and food culture of a South American vineyard estate. Grilled foods, particularly steaks, are front-and-center on the menu, but don't call it a steakhouse--there are plenty of other worthy bites coming from Chef Victor Albisu's kitchen. The server's description of the food is no joke: even the lemonade is smoked and garnished with grilled lemon. At first sip the signature drink tastes just like a regular lemonade but then the wood smoke flavor hits you as an unexpected aftertaste. 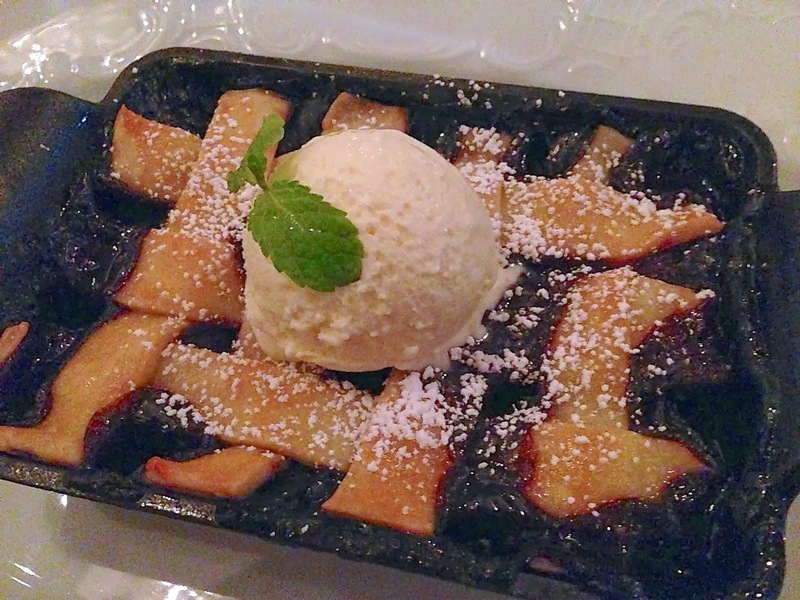 It's this combination of smoky and something else--sweet, vibrant, earthy--that shows the food at Del Campo is not just touched by fire but thoughtfulness too. Despite their ubiquity, smoky/charred flavors are kept in check by vibrant, fresh ingredients. Steaks are brightened by the tangy, herbal burst from chimichurri sauce that accompanies them. Brussels sprouts bronzed by a hot oven and served with meaty chunks of bacon are sweetened with honey and golden raisins. Unable to decide on one type of steak during our recent dinner, we opted for two: filet mignon and ribeye, both of which were expertly cooked to our requested medium-rare and seasoned just so. 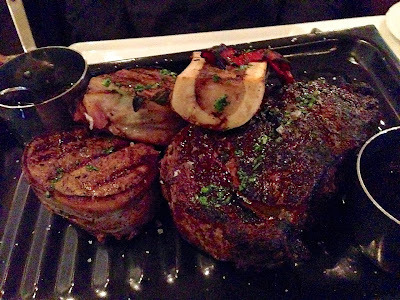 It's hard to say whether we preferred the more flavorful 18-ounce ribeye or the more tender filet wrapped with bacon concealing leaves of sage. Both were excellent. As an added treat, the steaks came with a helping of bone marrow so rich it's like foie gras. 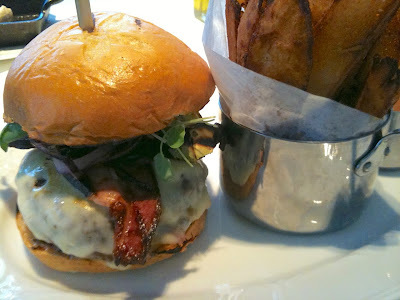 There is no shortage of good hamburgers in D.C., but Del Campo's holds its own against the city's best. When I ordered one for lunch, I wondered if it would be enough to sate my appetite. The answer was a resounding yes. The generous sandwich arrived with a juicy, perfectly medium patty topped with thick, meaty bacon (more like the British style), grilled avocado and charred tomato. On the side was a helping of giant steak fries--as big as I'd ever seen. Grill marks on the soft bun showed that even it spent some time near the flame. Speaking of bread, the rolls that start meals at Del Campo are delicious. Served in cast iron, rather than a basket, they've been piping hot every time I've had them, lightly charred on one side and served with smoked olive oil and smoked sea salt. 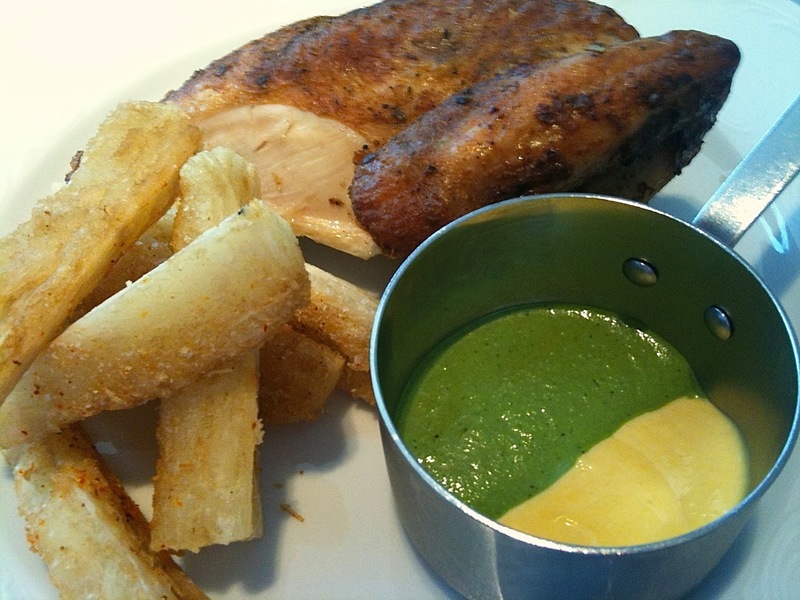 Away from the grill, Del Campo offers an excellent Peruvian roast chicken with skin rubbed with a spice blend and crisped by a layer of duck fat between it and the juicy flesh. Yuca fries, which I've had in uninteresting forms before, are nicely crisped on the outside and soft on the inside. Since steak is a year-round dish, the starters, salads and sides are where Del Campo shows its seasonality. A grilled ñoquis (i.e. 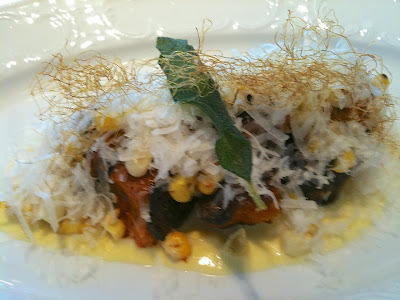 South American gnocchi) served during the summer arrived with smoked tomatoes, grilled corn and a beautiful garnish of fried corn silk. 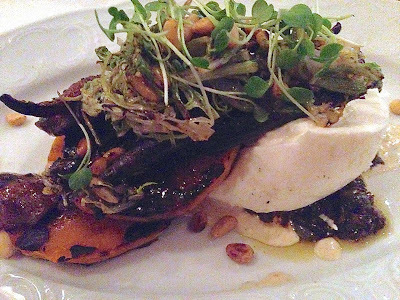 More recently, I was equally impressed by the burnt fall vegetable salad with charred slices of butternut squash, carrots that really flirt with the dark side of charred, milky burrata and pine nuts. With so much food on hand, it would be easy (and perhaps necessary) to skip dessert, but then you'd miss delightful treats like grilled pear and rosemary skillet pie, its fruit darkened by malbec, topped with lattice and served with a cool dollop of vanilla ice cream. A summer dessert of coffee mousse with hazelnut dacquoise was absolutely divine. I've been craving another helping of silky smooth mousse ever since (hopefully it will return to the menu soon). Service at Del Campo is top-notch. Everyone I've encountered there has been very friendly and attentive, as well as knowledgable. When I dined solo at lunch, the server shared lots of interesting tidbits about the food and restaurant (including hints of what I could expect if I returned for dinner). When I stumped her with a question about whether the chicken was brined, she remembered to follow up with the kitchen and returned later with the answer (it's not, apparently). A server at dinner was so knowledgeable about the wines on offer that sommelier advice would not have been necessary. Even during Restaurant Week, during which restaurants sometimes get a bad rap for their service, there was no difference in how the staff made me feel completely welcome. These people are clearly fans of the food and drink being served, an important step in making the diner into one too. They've certain found a new fan in me. Del Campo, 777 I Street NW (on the corner of 8th Street), Washington, D.C. (Chinatown), (202) 289-7377. Reservations: Open Table. Nicely written review. Thanks for bringing me here for dinner. I enjoyed it. I'd love to return for lunch and sample some of those fries.